This is a fully featured option, while its more expensive, the issues that will be faced with a pure RDP options will add to cost for support over time and anything other than the most basic small 10 man organisations will become a burden. Run into Microsoft licensing issues on AWS, but has better advance networking features. As Microsoft is the core product for Windows Desktop, this is the ideal voice. Too restrictive,, when a complex customer requirement is required, this model wont allow for that..
No way, i want to have complete ownership and flexibility and to reduce any middle men. Shared Delivery Group/Shared Delivery site isolation. Use Azure to increase End-to-End Partnership with Microsoft. Use Citrix Workspace for entry / Dashboard access. Microsoft Antimalware for Azure Cloud Services. 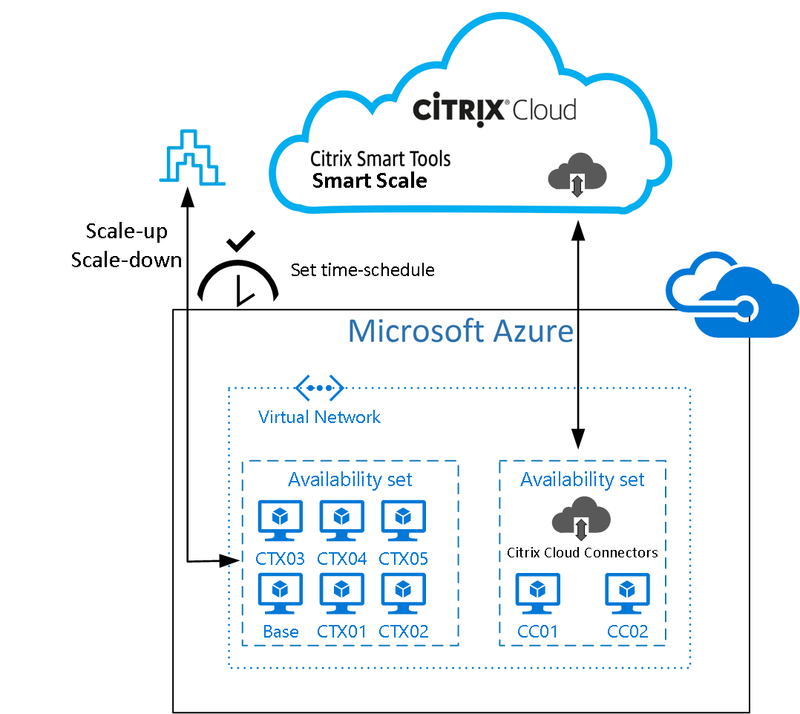 Citrix Cloud is way too early and missing critical features and not secure. ** SSL is not yet supported in Citrix Cloud for the StoreFront or NetScaler traffic, so Citrix recommends configuring firewall rules, VLANs, and/or IPsec tunnels for these services. What firewall rules is require to restrict access to Citrix Cloud IPs and any other secure design information. $12.00 USD per user/month, NetScaler Gateway Service, 1 GB data transfer per user per month, 25 minimum user per month.
' static image for VDI deployment based on MSFT and Citrix recommendations.
' Increase Disk I/O Timeout to 200 seconds. I wanted to highlight and explain the complexity of designing Application Deployment and Management for Windows Desktops and VDI environments in a single diagram. There are so many options for Application Deployment and they are all very complex and architecturally different and affects the user interaction with the application. You can also have combination of these application deployment and management technologies. Example Citrix XenApp + AppV + SCCM. Combining this with the complexity of User State and profile management options, it is no wonder many VDI projects fail and cause major frustrations for end users. Since writing this article and doing some more research on VMWare AppVolumes and UniDesk. http://www.unidesk.com/software, could solve the problem of delivering applications and maintaining Microsoft and Application updates. and of course Persistent vs Non- Persistent Desktops, Pooled vs Static,etc.. add to the complication and that is another topic. I thought this was a relevant diagram on the subject. But, dont worry, I am building a DaaS platform to solve all of this.. So, now that we understand the issues, how do we solve the problem. Here is some technology that is absolutely required for any VDI deployment. each ConfigMgr Site security rights to publish in each of their domains. NOT Installed – In Server Manager select Features, Add Features, Select .NET Framework 3.5, also select WCF Activation and when prompted answer Add Required Role Services click next and next again. (Make sure the BIT and IIS service is running/restart after install). IIS \ Sites \ Default Web Site\ WebDAV Settings ???? Run the Installed and install the Reporting Services on the SQL Server. Install App-V Remote Application Packager – http://www.microsoft.com/en-us/download/details.aspx?id=36216. Customer must purchase all Windows 8 OS Licenses. Customer must purchase all Virtual Desktop Access licenses. (If the client devices aren’t PCs covered by [Software Assurance]. Windows Virtual Desktop Access (VDA) is an authorization strategy that requires each device seeking access to a Windows virtual desktop in a virtual desktop infrastructure (VDI) to be licensed. Windows Virtual Desktop Access (Windows VDA): A standard benefit of Software Assurance and a stand-alone subscription-based license which allows roaming access to Windows virtual machines (VMs) from thin clients, third party, and non-Windows-based devices. The goal of Windows Virtual Desktop Access is to simplify licensing requirements in a virtual environment by licensing the devices that seek access to virtual desktops, instead of licensing the virtual desktops themselves. Because VDA is included as a feature of Software Assurance (SA), primary users of devices covered by SA can access their virtual desktops at no extra charge. Microsoft defines a primary user as someone who has used the computing device for more than 50% of the time in a 90 day period. If the user wishes to access a Microsoft VDI from a device that is not covered by Software Assurance, however, a separate Windows VDA license is required. Such devices include thin clients, zero clients and third-party devices such as contractor-owned PCs. As of this writing, a separate VDA license costs $100 per year, per device. The Microsoft MSP must provide the Windows 8 OS on DEDICATED hardware and not shared infrastructure with any other customer. Which cannot be used to provide any kind of service to any other customer of the service provider. Microsoft advise the dedicated-hardware requirement applied to all of the hardware utilised to provide the solution to the customer: servers, storage and, presumably, switching infrastructure as well. Windows 8 can be used for Rental Desktops can not be used either. Remote access. Rental Rights do not allow for remote access to software. Microsoft Rental Rights are a simple way for companies to rent, lease, or outsource desktop PCs with Windows desktop operating system and Microsoft Office licenses to third parties (such as Internet cafés, hotel and airport kiosks, business service centers, and office equipment leasing companies) through a one-time license transaction valid for the term of the underlying software license or life of the PC. Solidify your role as trusted advisor by helping your customers be in compliance, by using an additive license that fits their business model—without requiring special tools, processes, reporting, or paperwork.